Time Management: Master This Skill and Change Your Life – Forever! A Proven, Time Management System That Will Help You STOP Wasting Time and START Getting More Important Tasks Done, Faster! THE RESULT: Simplify your life, prioritize your tasks and dramatically decrease your stress levels. You rush from one task to another, feeling stressed, overwhelmed, and like you always have to be “on.” You feel like your life is out of your control – and other people's constant needs – for conversations, meetings, and errands – take over your days. You begin lots of great projects, filled with enthusiasm, but that excitement dwindles as other items plague your to-do list, and you often fall short of completion. You always feel “busy,” but no matter how much you do, you always have more to do – and you struggle to decide what you should do first. If it does, you're not alone. So many people struggle with time management – especially in today's society, where it seems like everyone is doing more of everything. Good news: you CAN become the master of your own time. And when you do, you become the master of your life. So if you've been feeling stressed and anxious because you simply have too much to do and not enough time to do it, it's time to take a critical look at your time management skills. Introducing “Time Management Made Simple,” the ultimate tool in mastering one of the most important skill sets in your life. This set is really all you would need to become an excellent time manager. It has helped me double my income, now I'm working on tripling it. Thanks Brian! I've spent the past several decades studying the roots of success – and one of the most important components of ultra-success is time management. I designed “Time Management Made Simple” to help you double your productivity, prioritize your key tasks and spend more time doing what you enjoy. Order your copy today and begin managing your time effectively – now! 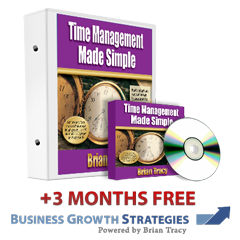 Order “Time Management Made Simple” today! I’ve learned a lot from him and his books. One thing that contains the most powerful sentence I have ever read: “Those without written goals are forever condemned to work for those with them.” So I opened my mind and learned to develop my abilities both in education (ELT) and sport (Table Tennis) through his good words. His inspired ideas have shown me how to be successful in spite of all obstacles on the path, I have decided to become the top and A, ELT student in my university on the running and ongoing term (semester). His ideas and offers seemed very practical in any job, especially teaching and I guess personal success and Brian Tracy are synonymous. He makes the case clearly and then proves it in his own remarkable life. If he recommends it, do it. Because he knows what he’s talking about.